Large companies frequently have corporate employee handbooks that are updated on an annual basis to reflect changes in employment laws or company policies. However, many small business owners with few employees may not see the need in having such a handbook that formally sets out employment policies and rules. While it is true that simply speaking to employees about your policies may be easier and more time-efficient than developing an official handbook, there are several reasons why it is worth taking the time and energy to do so. Many new business owners have not taken the time to sit down and formulate official policies when it comes to employees. Owners may be tempted to “wing it” when it comes to worker management and develop rules along the way. This can be risky, however, and can lead to disputes if there are not rules set in stone. Developing a handbook will make it necessary for you to sit down and decide what types of policies you want for your employees. This can ensure that your policies are applied fairly and evenly from the start to all workers. Many small business owners try to keep the workplace atmosphere friendly and casual to increase employee satisfaction. However, certain employees may take advantage of this type of atmosphere to the detriment of the business. For example, if you have not expressed a clear formal policy in regard to absenteeism or tardiness, employees may try to push the boundaries by missing work or showing up late on a regular basis. If you approach an employee with concerns, they may then claim they had no idea that they were breaking any rules. Having a handbook with clear policies informs workers of your expectations from the start so they may be less likely to take advantage of a friendly work environment. Even small business owners may find themselves accused of unlawful employment practices such as discrimination, retaliation, or wrongful termination by a disgruntled employee. 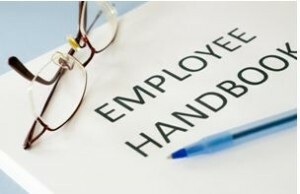 Your handbook can serve as evidence that you were simply enforcing a fair policy of which the employee had knowledge. A handbook can also demonstrate that you had anti-discrimination and harassment policies in place to protect employees from such unlawful actions. While developing a handbook may seem daunting, an experienced employment law attorney can help you formulate and express policies in an efficient and effective way. Having consistent and fair policies will only improve your workplace environment, even if you have only a few employees. If you need assistance in drafting, reviewing, or updating an employee handbook or if you have any additional employment concerns, please do not hesitate to contact the experienced lawyers at Structure Law Group, LLP for help. Structure Law Group is a San Jose based law firm that serves its clients’ business, employment and real estate needs, including but not limited to business formations, debt and equity investments, employment agreements, commercial leasing and purchases, commercial contracts and related litigation.